Powers/Abilities: Derath possesses the typical attributes of a member of the A'askvarii race. He possesses six arms, all covered with tentacles on the tips. He possesses gills and is presumably amphibious; he requires a special uniform to prevent rapid dehydration on land. He possesses rudimentary telepathy, enabling him to assimilate the language of another sentient by direct contact with him or her. In addition, Derath used a variety of advanced equipment. These include his Converter, which was able to construct molecule-thick body suits to protect others from harsh climates. He used a laser pistol able to incinerate a Dune Cat (a tiger-like creature of Kirgar). Derath possessed advanced training in Physics, and he was trained in technology beyond that of Earth's. He claimed to be able to construct a functional starship given the materials and some basic tools. (Black Goliath#5 (fb) - BTS) - Derath was once the foremost Farscout in the A'askvarii fleet, an explorer seeking life on other worlds. (Black Goliath#5 (fb) - BTS) - Derath encountered enough mammals in his time to learn of their susceptibility to temperature extremes (which was less than that of the A'askvarii). (Black Goliath#5 (fb) - BTS) - Derath had heard of the planet Kirgar and its legends, but, like most others, believed it to be a mere legend. (Black Goliath#5 (fb) - BTS) - On one mission, Derath discovered the desolate (desert and mountains) Kirgar (second planet from the blue-white star Dharhalla), and his sensor scans revealed a significant amount about the planet's former stronghold (the mere tip of which existed as a pyramid above the sands) before he carelessly crashed on Kirgar , damaging his ship beyond repair. Derath knew that there was available equipment in the former stronghold of the Kirgar, but he lacked the strength and endurance to survive the trek across the hostile terrain of Sharra's Forge to reach it. The length of time Derath was on Kirgar is unrevealed. (Black Goliath#5) - The Earth hero Black Goliath, along with Celia and Keith Jackson were banished to Kirgar by an energy blast from the Stilt-Man. Derath encountered the three of them, and after a brief misunderstanding when his attempts to learn their language by direct contact was mistaken as an attack, he showed them the way to the stronghold. Black Goliath protected the three others from the harsh environment of Sharra's Forge. Derath noted that without him they would never had found a possible way home, while without Black Goliath, he would have perished before reaching the stronghold. (Black Goliath#5 - BTS) - The journey took a night and a day of hard travel. (Black Goliath#5) - Upon reaching the pyramid tip of the stronghold, Derath noted that his sensors revealed that the base of the structure was set on the original floor of the desert, over a terrestrial mile beneath their feet. He further noted that the stronghold had stood inviolate for ten thousand centuries...but no longer, as he blasted a way into it. Despite the information from his sensors, Derath remained worried, recalling the legend that when the last warlord of Kirgar died, he left a guardian to protect his stronghold; and, if the stronghold had survived all this time, might not the guardian also have survived as well? After wandering the facility for hours, Derath led his new allies to the stronghold's primary research center and turned on the facility's power and lights; despite what he already knew, Derath was astounded by the kilometer upon cubic kilometer of machinery and instrumentation stretching off in every direction. All of the equipment functioned as perfectly as they day they were first activated. Derath set to work almost instantly on devising a means of travel. 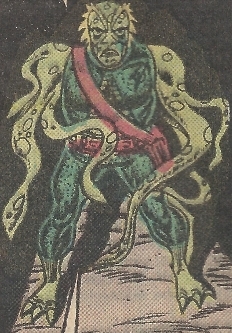 He quickly determined from the radioactive residue on Black Goliath's costume that the Stilt-MAn's beam weapon was powered by neutron star matter (indicating Stilt-Man was playing with incalculably deadly forces), warping local space about the trio; he set to work at a way to duplicate the effect in reverse, which would transport them all back to Earth. He successfully constructed a dimensional transporter to do just that. However, the guardian of the stronghold, a powerful robot named Mortag, had been activated by their entrance into the pyramid. Mortag stalked and prepared to strike a killing blow to Black Goliath and Celia Jackson, who had slipped away for a romantic interlude. Derath saw this and pushed them out of harm's way, taking a fatal blow to the back from Mortag's axe in the process. Keith Jackson decided to finish Derath's log and keep it until he could return it to his people and/or his family. Comments: Created by Chris Claremont and Keith Pollard. When threatened by Black Goliath, Derath invoked "by the First Egg..."
Whether that refers to some specific being, such as a deity, or just the first of Derath's species, or something else altogether, is anyone's guess. He also referenced "Lord of the Dark Tower..."
Derath seemed to be a benevolent, capable, and likeable guy. Too bad Bill and Celia had to get hot and bothered, or he would have survived and had a happy ending. Black Goliath#5 (November, 1976) - Chris Claremont (writer), Keith Pollard (artist), Archie Goodwin (editor).